Off to Houston Quilt Market today. 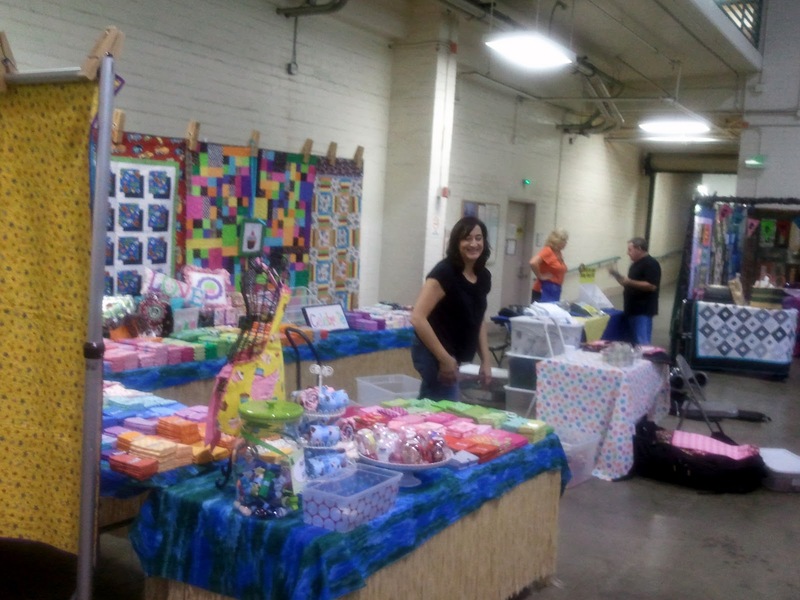 This past weekend we had a great quilt show with beautiful quilts, wonderful vendors, along with a great boutique and raffles galore. We even had a live and a silent auction. I managed to spread my money around the various vendors and have a great time at the auctions. Well, somebody has to help with the economy. I'm doing my part. 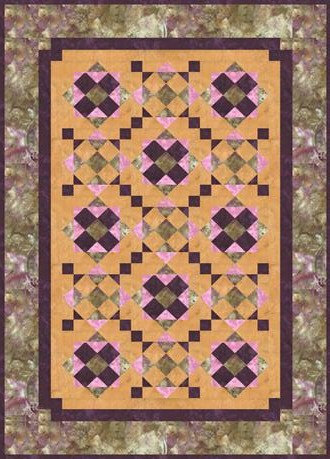 I won this gorgeous quilt at the live auction. I had been eyeing it on the wall. I could not get very close to it; but, I loved it right from the beginning. So, I decided that was going to be the one I would bid on and even put a dollar limit for it in my mind. When it finally came up to bid, what a surprise to hear that it was made by a member of my friendship group, Pat. This just made it all the better. Please visit her blog and see her amazing work. But, wait.... it is a two for one. This is the other side of the quilt. I know. How cool is that? Thank you my friend. You did a fabulous job. I also bought this table runner because it looks perfect in my house. I don't know if anyone took credit for this one. No label on the back. Come on quilters... you need to label your work. And that adorable Santa was made by Karen, and I managed to place the last bid in time to win it at the silent auction. Isn't he adorable? And, of course like most guilds, we had Opportunity Baskets for raffle. I'm fairly lucky with raffles. And, I won the one I wanted. If you know me, you understand why it is so perfect. It is a coffee basket. Oh yes. Just look at the loot, not to mention the four homemade placemats with coffee fabric. 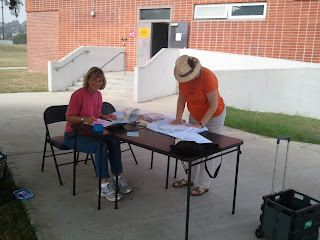 Thank you to the wonderful Quilt Show Chairs and their committee along with the many volunteers. Without you we never would have had such a wonderful event. Today was the first day of our quilt show and I know I told you we cannot take photographs inside the building, and we cannot. 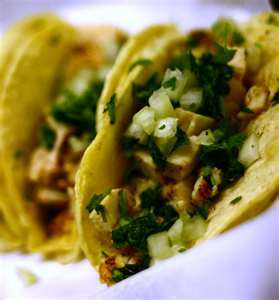 But, if you ask really nice, you can get the colonel to take a picture for you. He can. I didn't push my luck; I just asked for one. 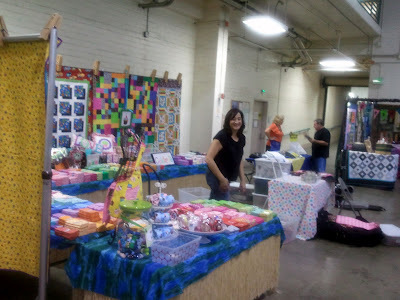 Quilters by the Sea Quilt Guild is having its quilt show this weekend, October 22 & 23, 2011. It is at the Armory is Long Beach. We cannot take pictures inside for obvious reasons. So we will be selling DVDs with pictures of all the quilt entries. Therefore, the only picture I have for today is of Karen and Becky sitting outside collecting quilts for hanging. It was quite a process setting up. But, I must say it looked wonderful when I left this evening. I hope to see some of your smiling faces in the next couple of days. I haven't been sewing lately. 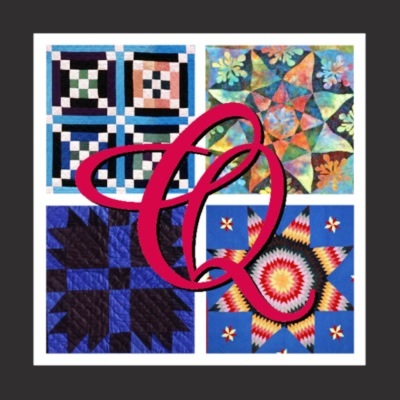 Two Wacky Women held a quilt retreat last weekend, featuring Lyn Brown. There were 26 of us including the Wacky Women and Lyn. 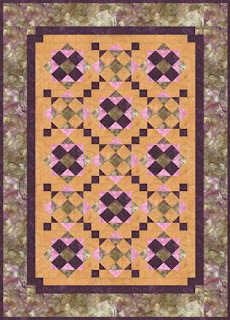 Lyn designed this quilt for the retreat and we had a contest to name the quilt. Lyn selected Gloria's name of Laguna Nights. Isn't that a great name? We all really had a great time. Go check out our Two Wacky Women website and read about our 2012 retreats. This weekend is Quilters by the Sea's quilt show. I have three quilts that will be in the show. They are packed and ready to take for hanging tomorrow. The show is Saturday, October 22, & Sunday, October 23, 2011. If you are in the area, I sure hope you can make it. You can read about it here. But for today, the two big elm trees are getting trimmed and the girls are at the groomers. The trees get trimmed once a year. The girls get groomed once a month. Finally. And just in time for Thursday's Quilters by the Sea Meeting. You see, this was an UFO I committed to finish by the October meeting. I must say, this probably would have sat in its bag for a very long time had it not been for our Special Event committee who came up with this challenge. Big thanks to Ann, Pat, and Jerilee for being that inspiration to get those UFOs done. I have named it La Luce ed il Lato Sucro della Luna, Italian for The Light and Dark Side of the Moon. We struggled becoming friends; but, we now have a better understanding of one another. However, it really does have a dark side. Now on to my UFO that is due in December: Wavy Log Cabin. This quilt is so close to being done. But, it will probably be a couple more days. You see, I'm binding.....by hand. And, it is fairly large. Label is ready to go once it's done. Remember my recent post about the F-R-I-E-N-D-S swap I was in? You can read about it here. I received mine from my new friend, Judy. Judy lives in New York and I got this package only two days after she mailed it. Judy doesn't know me; but, she must be a good study. Look what she sent me. In case it is hard to figure out, I'll help. Fabric, 2 yards of darling Christmas fabric by Alexander Henry. Rotary cutter blades in 3 sizes. I know. How great is that? Inspiration from 3 current quilt magazines. Pretty cool right? Embroidered (by Judy) bookmark. I love it. Notions that include ruler grippers, point turner/presser & quilt marking chalk. Love it. Dark Chocolate tea towel. Do I need to say anything else? Soap, made by her friend and her friend's two autistic sons. And, they smell divine. Thank you so much my new friend Judy. It is like you've known me for a long time. Honest. 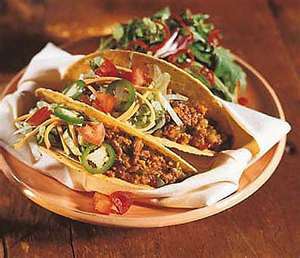 October 4, 2011 is National Taco Day. 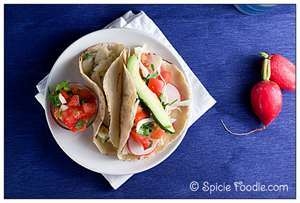 There are many different tacos out there, beef, pork, potato, fish.... to name a few. Looks like my lunch is planned. Kristina from Sew Prim Khris, organized a F-R-I-E-N-D-S Swap a while ago. We were to get together 7 small gifts to spell out FRIENDS. Due to traveling for Judy (my swapping friend) and our recent Two Wacky Women quilting retreat, I just got it in the mail today.